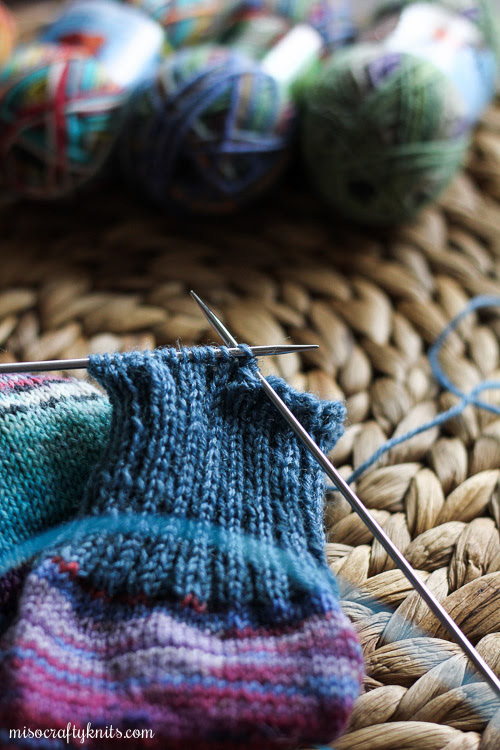 Miso Crafty Knits: It's May! Oh my goodness, it's May! Already?? Better question yet, where have I been all this time? I honestly feel like I've been busy and yet I don't feel like I've accomplished anything at all. Such a weird state to be in. Maybe that means I need to re-evaluate my schedule and maybe some better time management skills? Or maybe that means I've been doing more things outside of what I want to do? Whatever it is, I'm not prepared for it to be May, or for the warmer weather for that matter. I feel like I'm still stuck in February or something and want to be able to keep wearing my warm woollies without sweating buckets! Speaking of warm woollies, I've had to put a few projects on time out. It seems that my bad knitterly luck hasn't run out yet. As I've mentioned in this post I've had to rip back a sock WIP twice already and I've discovered that I have to rip it back...again. Not only is the gusset heel is just too loose over my super narrow heel but the length of the sock is a tad too long, even though I had ripped out a few extra rounds. I think this sock and a gusset heel just weren't meant to be. The yarn is just too stretchy and bouncy that I would have to either go down several needle sizes or use few stitches to make the sock feel like I want it to and I'm not willing to do either. Which means I'll have to try out a different heel. But for now, I've put the sock in time out and decided to cast on a new sock. Don't judge. It's for the best. I decided to cast on socks using the Opal mini skeins that I got in my 2016 Christmas advent calendar. I've been wanting to knit up these minis ever since I opened them up but was always swayed away by other knits. Well, it was time to finally dig into them. I don't know what it is about these minis, but I couldn't stop knitting with them. They're like little woolly potato chips! The first sock had whipped up much faster than I had anticipated and a week later I almost have a pair of socks! I say almost because it's been taking me forever to bind off the second sock (as seen in the photo above). Not by choice though. More like things kept popping up...like my son's class being dismissed, smelling something burning in my oven (oops!) and running errands solo, to name a few. I've also decided to put my Fireside Pullover on hold for a few days, even though the knitting on it has been going great. Until I got to the sleeves, that is. I was so happy that the pullover was working up just right that I didn't think much about the sleeves. I was almost finished with the first sleeve when I got this feeling in the pit of my stomach that something wasn't right. Uh-oh. I quickly tried the pullover on and yeah...the sleeve was a good five inches too long on my short T-Rex arm. But not only that, the upper arm had more positive ease than I would like. Yeah, I'm going to have to rip the sleeve all the way to the beginning, to when I had to pick up stitches for the underarm. Can you say, bummer? I still haven't gotten around to frogging back my Kveta shawl, mainly because I'm procrastinating, and there are other WIPs that I should really finish up. So that's my goal for May: to get at least two WIPs off the needles. Ideally, I would like three, but realistically it looks like only two is possible. The month of May has always been a busy one - school activities and events, travel plans, and personal goals. I've agreed to volunteer at my son's school to help out his class with the annual art show, as well as helping the class with their quilt blocks for a quilt they are planning to donate to the local SPCA. The school's annual year-end fundraiser is also later this month (I've knit a shawl for it! ), and there's also IEP meetings to attend and a parent appreciation day that my son always looks forward to. The Mister's birthday and our anniversary is later this month, and for the first time in years the Mister won't be travelling for the long weekend! If that didn't seem like a lot, I've also made it my mission to finally buckle down and get my sewing closet in tip-top shape (re: it needs be purged like you wouldn't believe. I mean, I found SIX super large bags of poly-fil in there. Six!! Who needs that much??). I just hope that I can squeeze in some knitting AND sewing!! Speaking of which, maybe I can sneak in a quick frogging session before I have to pick up the Kiddo...? I better jump on that while I can and while I have the motivation to! I hear you, April was completely batshit and suddenly it's May!